Walleye Fishing. To some anglers, it's the only fish to stalk and catch. Offering beneficial tips and secrets on how to land the big one. Some folks call them "walleye pike," but that's just a nickname and it stops there. This species is not in the pike family at all, but in the perch family. A saying I have heard over the years is that everyone has a twin somewhere. This also applies to the "willy." They have a "kissing-cousin," that looks just like them and they are called saugers. The difference between the two? The sauger have spots on the dorsal (top) fin and no white tipping on the tail. It also has blotchy patches on the sides and is a river fish. (unless it is dammed up) Saugers do not get as big as their cousins and will feed all day; walleyes feed in low light periods and at night. The offspring of these two fish are called saugeye. They have both characteristics. Spots on the dorsal fin and on the tip of the back bottom lobe. There you have it. So now when you are walleye fishing and catch one - you'll know all about it. If the fish you caught is 15 inches long and weighs just over 1 pound; you've just landed a average sized fish. In Wisconsin it takes 5 years for them to grow 15 inches and the female is larger than the male (and smarter of course). When do they spawn? They are not territorial like the salmon and broadcast their eggs anywhere in rocky streams and shorelines. They like shallow water; one to three feet deep. When the water temperature is 34-36 degrees, the "guys" are already scoping the lake and rivers for spawning areas. They are biting at this time and up until the female joins them on the bed. Peak spawning times are when the water reaches approximately 42-43 degrees. It takes almost two weeks for the eggs to hatch and are around 1/4 inch long. The water current will hopefully take them to areas in the water that are abundant in food, where they can also hide from just about anything that moves until they get bigger. How do you catch one? In the mouth of course. Walleye fishing is a little different. Casting and catching is not as easy as a bluegill, but once you get the hang of it you will be landing more walleyes than you ever thought you could. What do you use for walleye bait? This predator is a perch-addict. When you are catching perch, just know that walleyes are also in the area. I catch them (and perch) by vertically jigging just off the bottom of the lake with minnows, leeches and even night crawlers. We do not fish rivers around here; they are polluted and the fish are full of mercury (and who knows what else). But if you only fish the rivers, your best bet are the wing dams. Speaking of mercury; women in child-bearing years (and children until the age of 18) should only consume walleye, muskie, northern pike (predators really) once a month. Panfish can be eaten once a week. 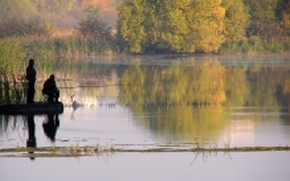 Here's a walleye fishing tip; in a lake, find a point or inside turn or underwater humps are the first places to look. Predator fish are just like animals; they routinely follow weed trails back and forth from water up to 14 feet deep.